This chapter introduces a new plugin called ‘Alignment’ that comprises of tools to perform text alignment at various level (e.g word, phrase, sentence etc). It allows users to integrate other tools that can be useful for speeding up the alignment process. Text alignment can be achieved at a document, section, paragraph, sentence and a word level. Given two parallel corpora, where the ﬁrst corpus contains documents in a source language and the other in a target language, the ﬁrst task is to ﬁnd out the parallel documents and align them at the document level. For these tasks one would need to refer to more than one document at the same time. Hence, a need arises for Processing Resources (PRs) which can accept more than one document as parameters. For example given two documents, a source and a target, a Sentence Alignment PR would need to refer to both of them to identify which sentence of the source document aligns with which sentence of the target document. However, the problem occurs when such a PR is part of a corpus pipeline. In a corpus pipeline, only one document from the selected corpus at a time is set on the member PRs. Once the PRs have completed their execution, the next document in the corpus is taken and set on the member PRs. Thus it is not possible to use a corpus pipeline and at the same time supply for than one document to the underlying PRs. We have introduced a few new resources in GATE that allows processing parallel data. These include resources such as CompoundDocument, CompositeDocument, and a new AlignmentEditor to name a few. Below we describe these components. Please note that all these resources are distributed as part of the ‘Alignment’ plugin and therefore the users should load the plugin ﬁrst in order to use these resources. A new Language Resource (LR), called CompoundDocument, is introduced which is a collection of documents and allow various documents to be grouped together under a single document. The CompoundDocument allows adding more documents to it and removing them if required. It implements the gate.Document interface allowing users to carry out all operations that can be done on a normal gate document. For example, if a PR such as Sentence Aligner needs access to two documents (e.g. source and target documents), these documents can be grouped under a single compound document and supplied to the Sentence Alignment PR. To instantiate CompoundDocument user needs to provide the following parameters. encoding - encoding of the member documents. All document members must have the same encoding (e.g. Unicode, UTF-8, UTF-16). collectRepositioningInfo - this parameter indicates whether the underlying documents should collect the repositioning information in case the contents of these documents change. preserveOriginalContent - if the original content of the underlying documents should be preserved. documentIDs - users need to provide a unique ID for each document member. These ids are used to locate the appropriate documents. FileName.id.extension (ﬁlename followed by id followed the extension and all of these separated by a ‘.’ (dot)). For example if user provides three document IDs (e.g. ‘en’, ‘hi’ and ‘gu’) and selects a ﬁle with name ‘File.en.xml’, the CompoundDocument will search for rest of the documents (i.e. ‘File.hi.xml’ and ‘File.gu.xml’). The ﬁle name (i.e. ‘File’) and the extension (i.e. ‘xml’) remain common for all three members of the compound document. Figure 20.1 shows a snapshot for instantiating a compound document from GATE Developer. Compound document provides various methods that help in accessing their individual members. The following method returns a map of documents where the key is a document ID and the value is its respective document. As described later in the chapter, the entire compound document can be saved in a single xml ﬁle. In order to load such a compound document from the saved xml ﬁle, we provide a language resource called CompoundDocumentFromXml. This is same as the Compound Document. The only diﬀerence is in the parameters needed to instantiate this resource. This LR requires only one parameter called compoundDocumentUrl. The parameter is the url to the xml ﬁle. 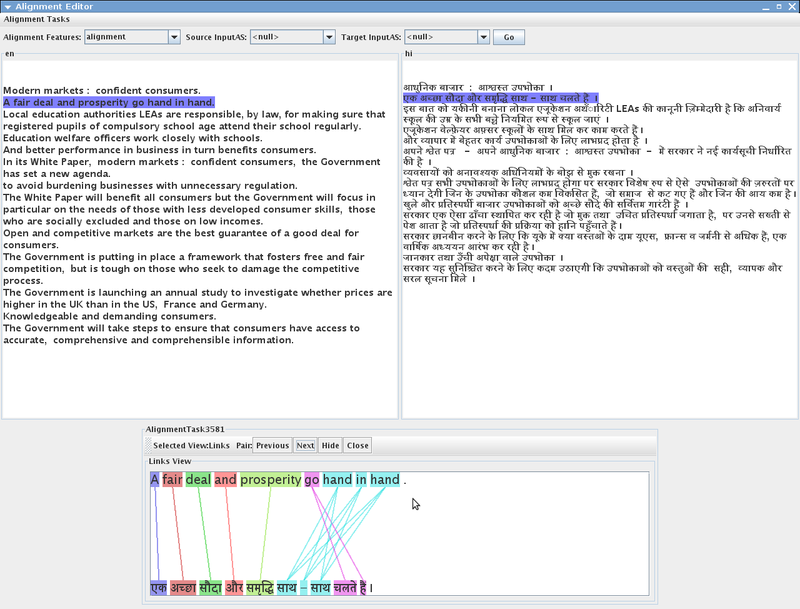 The compound document editor is a visual resource (VR) associated with the compound document. The VR contains several tabs - each representing a diﬀerent member of the compound document. All standard functionalities such as GATE document editor, with all its add-on plugins such as AnnotationSetView, AnnotationsList, coreference editor etc., are available to be used with each individual member. 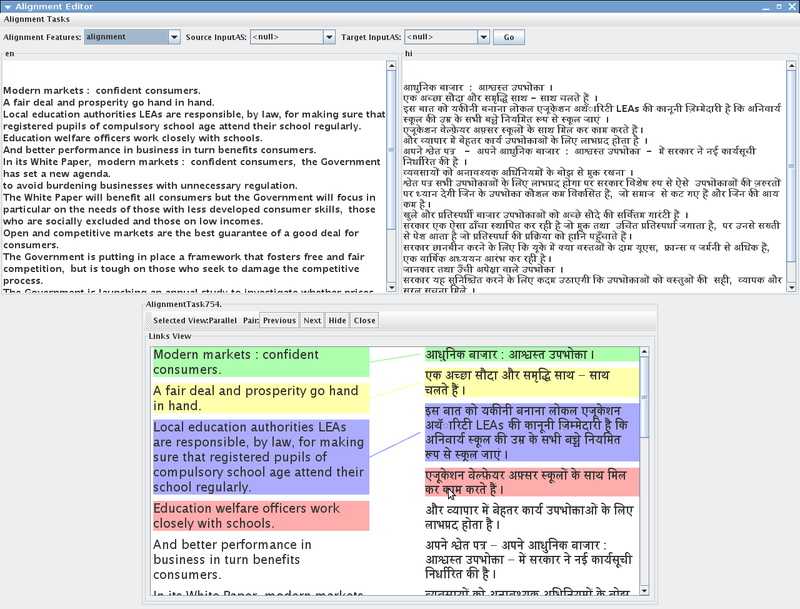 Figure 20.2 shows a compound document editor with English and Hindi documents as members of the compound document. As shown in the ﬁgure 20.2, there are several buttons at the top of the editor that provide diﬀerent functionalities. For instance, the Add button, allows adding a new member document to the compound document. The Remove button removes the current visible member from the document. The buttons Save and Save As XML allow saving the documents individually and in a single xml document respectively. The Switch button allows changing focus of the compound document from one member to the other (this functionality is explained later). Finally, the Alignment Editor allows one to start the alignment editor to align text. The composite document allows users to merge the texts of member documents and keep the merged text linked with their respective member documents. In other words, if users make any change to the composite document (e.g. add new annotations or remove any existing annotations), the relevant eﬀect is made to their respective documents. A PR called CombineMembersPR allows creation of a new composite document. It asks for a class name that implements the CombiningMethod interface. The CombiningMethod tells the CombineMembersPR how to combine texts and create a new composite document. For example, a default implementation of the CombiningMethod, called DefaultCombiningMethod, takes the following parameters and puts the text of the compound document’s members into a new composite document. The ﬁrst parameter tells the combining method that it is the ‘Sentence’ annotation type whose text needs to be merged and it should be taken from the ‘Key’ annotation set (second parameter) and ﬁnally all the underlying annotations of every Sentence annotation must be copied in the composite document. If there are two members of a compound document (e.g. ‘hi’ and ‘en’), given the above parameters, the combining method ﬁnds out all the annotations of type Sentence from each document and sorts them in ascending order, and one annotation from each document is put one after another in a composite document. This operation continues until all the annotations have been traversed. The composite document also maintains a mapping of text oﬀsets such that if someone adds a new annotation to or removes any annotation from the composite document, they are added to or removed from their respective documents. Finally the newly created composite document becomes a member of the same compound document. This PR allows deletion of a speciﬁc member of the compound document. It takes a parameter called ‘documentID’ and deletes a document with this name. As described above, only one member of the compound document can have focus set on it. PRs trying to use the getDocument() method get a pointer to the compound document; however all the other methods of the compound document give access to the information of the document member with the focus set on it. So if user wants to process a particular member of the compound document with some PRs, s/he should use the SwitchMembersPR that takes one parameter called documentID and sets focus to the document with that speciﬁc id. Calling the toXml() method on a compound document returns the XML representation of the member which has focus. However, GATE Developer provides an option to save all member documents in diﬀerent ﬁles. This option appears in the options menu when the user right-clicks on the compound document. The user is asked to provide a name for the directory in which all the members of the compound document will be saved in separate ﬁles. It is also possible to save all members of the compound document in a single XML ﬁle. The option, ‘Save in a single XML Document’, also appears in the options menu. After saving it in a single XML document, the user can use the option ‘Compound Document from XML’ to load the document back into GATE Developer. Inspired by various tools, we have implemented a new version of alignment editor that is comprised of several new features. We preserve standard ways of aligning text but at the same time provide advanced features that can be used for facilitating incremental learning. 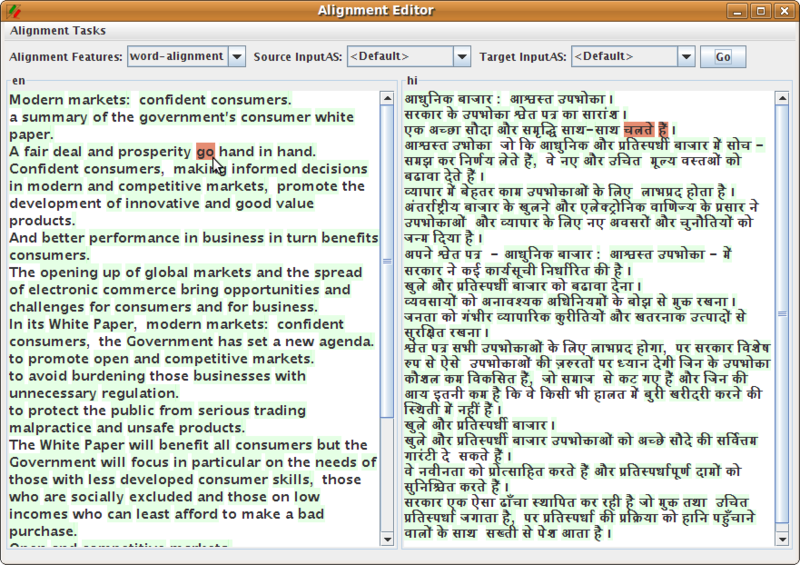 The alignment editor can be used for performing alignment at any annotation level. When performing alignment at word or sentence level, the texts being aligned need to be pre-processed in order to identify tokens and sentences boundaries. obtaining all the annotations that are aligned to a particular annotation. 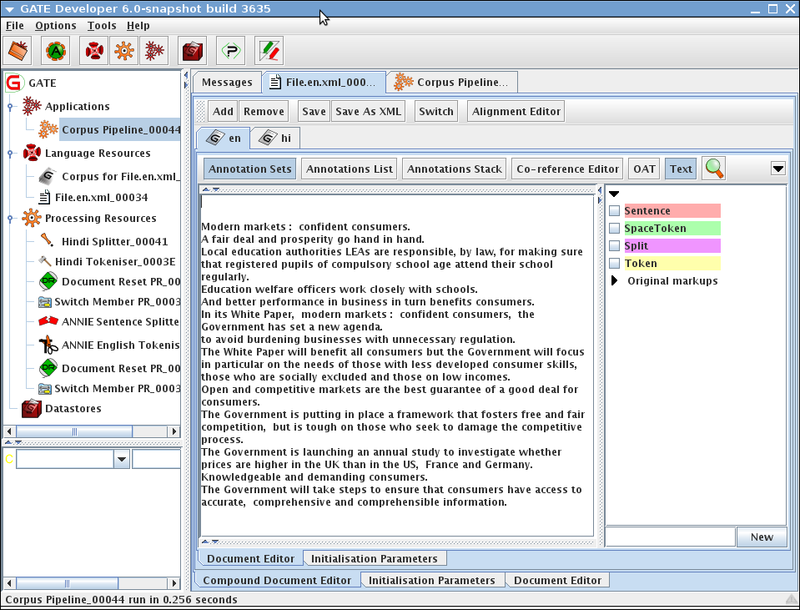 Given a compound document containing a source and a target document, the alignment editor starts in the alignment viewer mode. In this mode the texts of the two documents are shown side-by-side in parallel windows. The purpose of the alignment viewer is to highlight the annotations that are already aligned. The ﬁgure 20.3 shows the alignment viewer. In this case the selected documents are English and Hindi, titled as en and hi respectively. To see alignments, user needs to select the alignment object that he/she wants to see alignments from. Along with this, user also needs to select annotation sets - one for the source document and one for the target document. Given these parameters, the alignment viewer highlights the annotations that belong to the selected annotation sets and have been aligned in the selected alignment object. When the mouse is placed on one of the aligned annotations, the selected annotation and the annotations that are aligned to the selected annotation are highlighted in red. In this case (see ﬁgure 20.3) the word go is aligned with the words chalate hein. Before the alignment process can be started, the tool needs to know few parameters about the alignment task. Unit Of Alignment: this is the annotation type that users want to perform alignment at. Data Source: generally, if performing a word alignment task, people consider a pair of aligned sentences one at a time and align words within sentences. If the sentences are annotated, for example as Sentence, the Sentence annotation type is called Parent of Unit of Alignment. The Data Source contains information about the aligned parents of unit of alignment. In this case, it would refer to the alignment object that contains alignment information about the annotations of type Sentence. The editor iterates through the aligned sentences and forms pairs of parent of unit of alignments to be shown to the user one by one. If user does not provide any data source, a single pair is formed containing entire documents. Alignment Feature Name: this is the name given to the alignment object where the information about new alignments is stored. The purpose of the alignment viewer is to highlight the annotations that are already aligned. 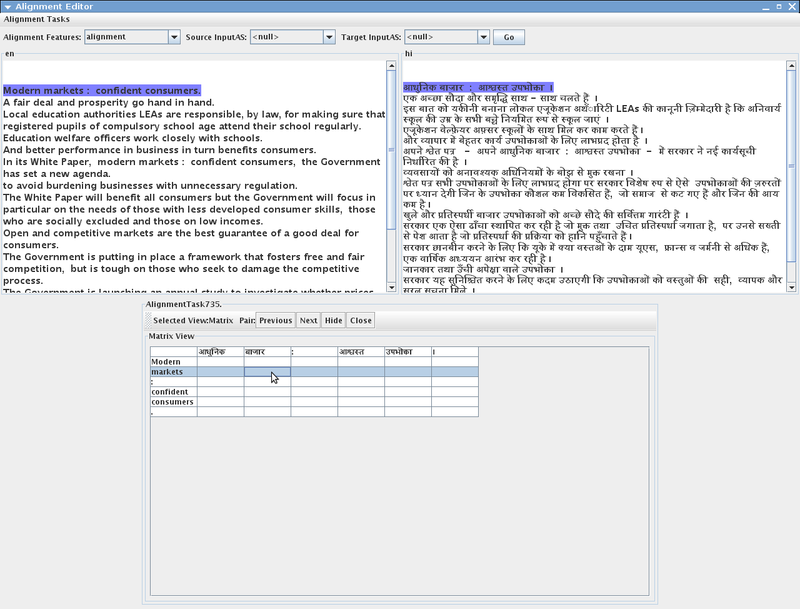 The editor comes with three diﬀerent views for performing alignment which the user can select at the time of creating a new alignment task: the Links view (see 20.4 - suitable for character, word and phrase level alignments), the Parallel view (see 20.5 - suitable for annotations which have longer texts, e.g. sentences, paragraphs, sections) and the Matrix view (see 20.6) - suitable for character, word and phrase level alignment. Let us assume that the user wants to align words in sentences using the Links view. The ﬁrst thing he needs to do is to create a new Alignment task. This can be achieved by clicking on the File menu and selecting the New Task option. User is asked to provide certain parameters as discussed above. The editor also allows to store task conﬁgurations in an xml ﬁle which can be at later stage reloaded in the alignment editor. Also, if there are more than one task created, the editor allows users to switch between them. To align one or more words in the source language with one or more words in the target language, the user needs to select individual words by clicking on them individually. Clicking on words highlights them with an identical colour. Right clicking on any of the selected words brings up a menu with the two default options: Reset Selection and Align. Diﬀerent colours are used for highlighting diﬀerent pairs of alignments. This helps distinguishing one set of aligned words from other sets of aligned pairs. Also a link between the aligned words in the two texts is drawn to show the alignment. To unalign, user needs to right click on the aligned words and click on the Remove Alignment option. Only the word on which user right-clicks is taken out of the alignment and rest of the words in the pair remain unaﬀected. We use the term Orphaned Annotation to refer to the annotation which does not have any alignment in the target document. If after removing an annotation from alignment pair, there are any orphaned annotations in the alignment pair, they are unaligned too. The options Align, Reset Selection and Remove Alignment are available by default. The Align and the Reset Selection options appear when user wants to align new annotations. The Remove Alignment option only appears when user right clicks on the already aligned annotations. The ﬁrst two actions are available when there is at least one annotation selected in the source language and another one is selected in the target language. Apart from these three basic actions, the editor also allows adding more actions to the editor. There are four diﬀerent types of actions: actions that should be taken before the user starts aligning words (PreDisplayAction); actions that should be taken when the user aligns annotations (AlignmentAction); the actions that should be taken when the user has completed aligning all the words in the given sentence pair (FinishedAlignmentAction) and the actions to publish any data or statistics to the user. For example, to help users in the alignment process by suggesting word alignments, one may want to wrap a pre-trained statistical word alignment model as PreDisplayAction. Similarly, actions of the type AlignmentAction can be used for submitting examples to the model in order for the model to update itself. When all the words in a sentence pair are aligned, one may want to sign oﬀ the pair and take actions such as comparing all the alignments in that sentence pair with the alignments carried out by some other user for the same pair. Similarly, while collecting data in the background, one might want to display some information to the user (e.g. statistics for the collected data or some suggestions that help users in the alignment process). When users click on the next or the previous button, the editor obtains the next or the previous pair that needs to be shown from the data source. Before the pair is displayed in the editor, the editor calls the registered instances of the PreDisplayAction and the current pair object is passed onto the instances of PreDisplayAction. Please note that this only happens when the pair is not already signed oﬀ. Once the instances of PreDisplayAction have been executed, the editor collects the alignment information from the compound document and displays it in the editor. As explained earlier, when users right click on units of alignment in the editor a popup menu with default options (e.g. Align, Reset Selection and Remove Alignment) is shown. The editor allows adding new actions to this menu. It is also possible that users may want to take extra actions when they click on any of the Align or the Remove Alignment options. The AlignmentAction makes it possible to achieve this. Below we list some of the parameters of the AlignmenAction. The implementation is called depending on these parameters. invokeForAlignedAnnotation - the action appears in the options menu when user right clicks on the aligned annotation. invokeForHighlightedUnalignedAnnotation - the action appears in the options menu when user right clicks on a highlighted but unaligned annotation. invokeForUnhighlightedUnalignedAnnotation - the action appears in the options menu when user right clicks on an unhighlighted and unaligned annotation. invokeWithAlignAction - the action is executed whenever user aligns some annotations. invokeWithRemoveAction - the action is executed whenever user removes any alignment. caption - in case of the ﬁrst three options, the caption is used in the options menu. In case of the fourth and the ﬁfth options, the caption appears as a check box under the actions tab. These methods can be used for, for example, building up a dictionary in the background while aligning word pairs. Before users click on the next button, they are asked if the pair they were aligning has been aligned completely (i.e. signed oﬀ for further alignment). If user replies yes to it, the actions registered as FinishedAlignmentAction are executed one after the other. This could be helpful, for instance, to write an alignment exporter that exports alignment results in an appropriate format or to update the dictionary with new alignments. Users can point the editor to a ﬁle that contains a list of actions and parameters needed to initialize them. A conﬁguration ﬁle is a simple text ﬁle with fully-qualiﬁed class name, and required parameters speciﬁed in it. Below we give an example of such a conﬁguration ﬁle. The ﬁrst argument is the name of the class that implements one of the actions described above. The second parameter is the name of the ﬁle in which the alignment cache should store its results. Finally, the third argument instructs the alignment cache to store root forms of the words in the dictionary so that diﬀerent forms of the same words can be matched easily. All the parameters (comma separated) after the class name are passed to the action. The relpath parameter is resolved at runtime. AlignmentCache is one such example of FinishedAlignmentAction and the PreDisplayAction. This is an inbuilt alignment cache in the editor which collects alignment pairs that the users annotate. The idea here is to cache such pairs and later, align them automatically if they appear in subsequent pairs, thus reducing the eﬀorts of humans to annotate the same pair again. By default the alignment cache is disabled. Users wishing to enable it should look into the plugins/Alignment/resources/actions.conf and uncomment the appropriate line. Users wishing to implement their own actions should refer to the implementation of the AlignmentCache. A compound document can have more than one member documents, the alignment information stored as a document feature and more than one alignment features. The framework allows users to store the whole compound document in a single XML ﬁle. The XML ﬁle contains all the necessary information about the compound document to load it back in Gate and bring it to the state the compound document was when saving the document as XML. It contains XML produced for each and every member document of the compound document and the details of the document features set on the compound document. XML for each member document includes XML elements for its content; annotations sets and annotations; document features set on individual member document and the id given to this document as as member of the compound document. Having a single XML ﬁle makes it possible to port the entire ﬁle from one destination to the others easily. Apart from this, the framework has an alignment exporter. Using the alignment exporter, it is possible to store the alignment information in a separate XML ﬁle. For example, once the annotators have aligned documents at a word level, the alignment information about both the unit and the parent of unit annotations can be exported to an XML ﬁle. Figure 20.7 shows an XML ﬁle with word alignment information in it. When aligning words in sentences, it is possible to have one or more source sentences aligned with one or more target sentences in a pair. This is achieved by having Source and Target elements within the Pair element which can have one or more Sentence elements in each of them. Each word or token within these sentences is marked with Token element. Every Token element has a unique id assigned to it which is used when aligning words. It is possible to have 1:1 or 1:many and many:1 alignments. 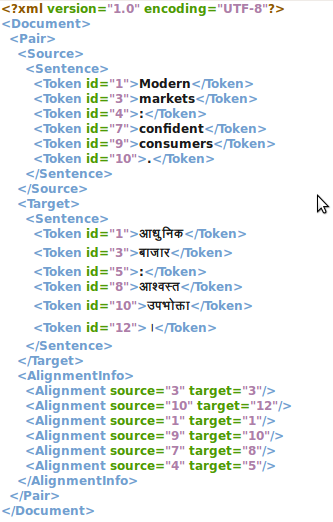 The Alignment element is used for mentioning every alignment pair with source and target attributes that refer to one of the source token ids and one of the target document ids respectively. For example, according to the ﬁrst alignment entry, the source token markets with id 3 is aligned with the target token bAzAr with id 3. The exporter does not export any entry for the unaligned words. For example, a patent document has several diﬀerent sections but user is interested in processing only the ‘claims’ section or the ‘technical details section’. This is also useful for processing a large document where processing it as a single document is not possible and the only alternative is to divide it in several small documents to process them independently. However, doing so would need another process that merges all the small documents and their annotations back into the original document. On the other hand, a webpage may contain proﬁles of diﬀerent people. If the document has more than one person with similar names, running the ‘Orthomatcher PR’ on such a document would produce incorrect coreference chains. All such problems can be solved by using a PR called ‘Segment Processing PR’. This PR is distributed as part of the ‘Alignment’ plugin. User needs to provide the following four parameters to run this PR. document: This is the document to be processed. analyser: This can be a PR or a corpus controller that needs to be used for processing the segments of the document. segmentAnnotationType: Sections of the documents (that need to be processed) should be annotated with some annotation type and the type of such annotation should be provided as the value to this parameter. segmentAnnotationFeatureName and segmentAnnotationFeatureValue: If user has provided values for these parameters, only the annotations with the sepciﬁed feature name and feature value are processed with the Segment Processing PR. inputASName: This is the name of the annotation set that contains the segment annotations. Given these parameters, each span in the document that is annotated as the type speciﬁed by the segmentAnnotationType is processed independently. Given a corpus of publications, if you just want to process the abstract section with the ANNIE application, please follow the following steps. It is assumed that the boundaries of abstracts in all these publications are already identiﬁed. If not, you would have to do some processing to identify them prior to using the following steps. In the following example, we assume that the abstract boundaries have been annotated as ‘Abstract’ annotations and stored under the ‘Original markups’ annotation set. Create a new corpus and populate it with a set of publications that you would like to process with ANNIE. Create an instance of the ‘Segment Processing PR’ by selecting it from the list of processing resources. Provide the corpus with publication documents in it as a parameter to the corpus controller. Select the ‘ANNIE’ controller for the ‘controller’ parameter. Type ‘Abstract’ in the ‘segmentAnnotationType’ parameter. Type ‘Original markups’ in the ‘inputASName’ parameter. Now, you should see that the ANNIE application has only processed the text in each document that was annotated as ‘Abstract’.